Today, let’s keep things super simple. I will only make two points. Actually… no. I won’t really make any points. You will make your own points. All I am going to do is show you something. What you do with it is entirely up to you. Okay… my work focuses on marketing management, which, when done properly, ties into sales, business development, product strategy, and so on. All of that drives growth for companies: revenue growth, market expansion (breadth) and penetration (depth), innovation, improvements in customer experiences, upticks in profitability, improved loyalty… the whole works. It is ALL connected. Get some of the core elements right, know how to connect all of the dots, and what you have is a ripple effect of improvement, a butterfly effect of success. That’s the model. It’s a lot like conducting a symphony, only every instrument is in a different room and you have to find ways of coordinating it all properly with the least amount of dissonance possible. All you really need to make that happen is use all of the tools at your disposal and focus on getting more and more things right. That requires skill and vision, sure, but it involves feedback. And by feedback, I mean data. Insights. Information on what works, what doesn’t, and why. Without that feedback, it can’t be done on any kind of scale. Over the last few years, marketing technologies have experienced a massive evolutionary leap. We can measure things today that we could not have dreamed of measuring 15 years ago. And the things we could measure 15 years ago, we can now measure faster, better, with more precision, and at a fraction of the costs we had to endure back in prehistoric times. Big data, computing capacity on-demand, software-as-a-service… all of these things have transformed campaign measurement, market research and pretty much all marketing functions from being laborious elements of what essentially amounted to leap-of-faith driven cost centers (you know it’s true) to what are now invaluable assets for any organization. Marketing done right is what made small companies into massively successful brands. And do you know what is always an element of success for these brands early on? Access to the right data. Why? Because good, actionable data keeps you from making the wrong decisions. Good actionable data opens doors and points the way. Good actionable data = eyes and ears, and without it, you’re just out there following hunch after hunch with your eyes closed. We have talked about how the cloud continues to level the playing field for small companies: they no longer have to invest millions of dollars into data mining, costly IT infrastructure, rigid software license schemes, and so on. Technology advances in the last decade are the equivalent of being able to bake a dozen chocolate chip cookie in 2014 vs. 1614: the ingredients (eggs, flour, chocolate, butter) would have cost a fortune back then, and would have been hard to come by for most households. Today, you can bake a dozen cookies for less than the cost of a ham sandwich. It’s cheap and easy and delicious. The cloud and computing power, including access to marketing data and analytics is exactly the same thing. And yet, in spite of so much ease and automation and computing power , in spite of the increasingly low cost of on-demand software, measurement and reporting, two thirds of all marketing departments STILL don’t bother with marketing analytics. 1. The bad news: two thirds of Marketing departments are tactically ineffective. Period. Whether the absence of marketing analytics results from an egregious skills gap or a deliberate effort to only focus on the creative/content part of the job isn’t super important. 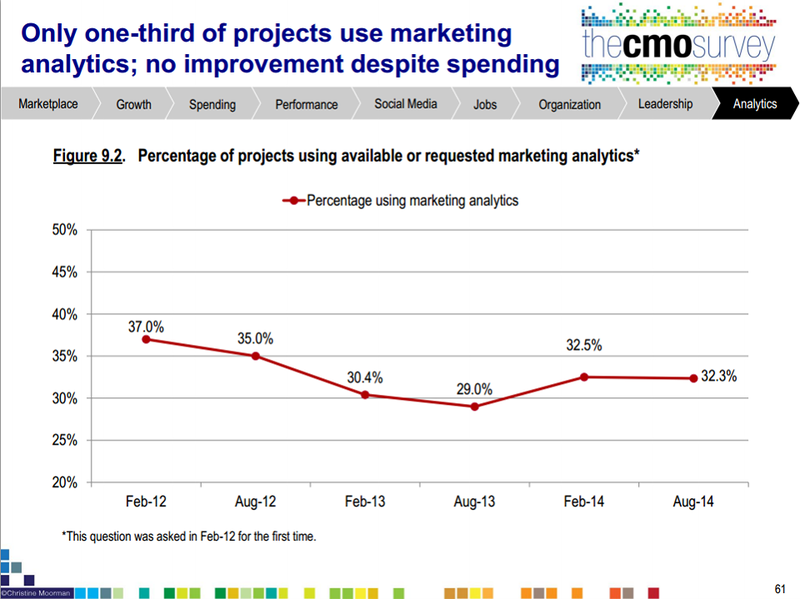 The fact is that about 68% of marketing departments appear to be a complete waste of funding. If you are reading this, it means that if your own marketing department (and/or partner) feels like a bad investment, the odds are that your feeling is spot-on. Time to either shake things up or look for a better Marketing team. And if you do nothing, nothing will change. That graph will still look the same in 2015, and your company will still be part of the almost 70% of businesses that are throwing good money after bad. Your marketing departments and/or agency partners still won’t be bothered to use 21st century tools, and most of what they do will continue to be a complete waste of time. Sadly, and I have no illusions about this, most companies will continue to operate this way, and they will continue to fail. With any luck, you won’t be one of them. 2. The good news: Maybe you’re already in the top third. If so, carry on. You have a tremendous advantage over 2/3 of the business world, so keep going. Keep moving forward. Don’t rest on your laurels. Being in the top third at this stage is just the price of entry to still be in business five years from now. To truly be successful, you still have a lot of work to do if you want to do more than just survive. And if you aren’t already in the top third, you can turn your disadvantage around, and that can start immediately. Regardless of how the above graph looks a year from now, or five years from now, as a decision-maker, you can choose what side of it your organization lives on. Being among the 1/3 of companies that leverage big data, the cloud, and marketing analytics (in other words, the 1/3 of companies benefiting from up-to-date market intelligence, highly adaptive sales funnels, real time consumer insights and feedback, and so on) is a choice. Let me say that again: it is 100% a choice. Likewise, being among the 2/3 of companies that waste money on blind, wasteful, ineffective marketing departments is a choice too, all day, every day. So… in light of what we have learned today, what’s your choice? Do you want to keep struggling, and wondering why your marketing isn’t working? Do you want to keep agonizing over why you don’t have as many customers as you would like? Why you aren’t growing? Why your customer retention isn’t improving? Do you want to keep operating that way, in a perpetual fog of unanswered questions? Or do you want to join the 1/3 of companies that are doing a lot better (and probably spending less than you are on better results)? Hat tip to the ever brilliant Avinash Kaushik for pointing me to this part of the survey.